I love Evernote. I use it for everything. Lesson plans, lesson schedules, notes, web clippings, lesson resources, travel notes and much more. I can access it on any computer and from my smartphone. I can even share notes and notebooks with other people (like my students). It is an indispensable app for me. Evernote also has the Evernote Trunk. The Trunk has apps that integrate with Evernote, scanners that scan directly to Evernote, pens that record what you write and send it to Evernote, and much, much more. There's even one that allows you to save things from your Twitter and Facebook streams directly into Evernote. There is also an education section in Evernote Trunk, that has apps and resources that work with Evernote and are great for education. 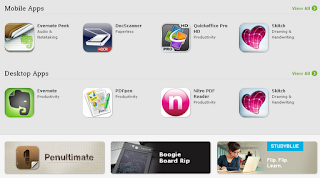 In addition to showcasing apps and hardware that work with Evernote, it also shows how they can be used in Education. It's a great resource for anyone who uses Evernote. People who are thinking about Evernote should go here to see how much it can do. The apps are excellent and the hardware makes going paperless (or nearly) easier.